Saints fans are not the only one outraged over the NFL’s lack of accountability in Sunday’s NFC Title game between New Orleans and the Rams. Louisiana’s governor is speaking out, as Gov. John Bel Edwards sent a letter Tuesday to NFL Commissioner Roger Goodell to express the “deep disappointment” of the people of Louisiana and Saints fans. 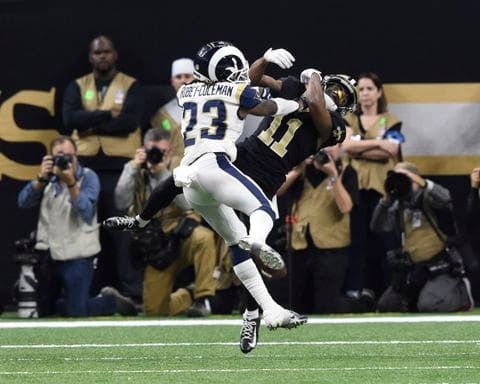 The Democratic governor complained about the failure of officials to call interference or roughness penalties when a Rams player leveled a Saints receiver with a helmet-to-helmet hit near the end of Sunday’s game. This could still get interesting before Super Bowl LIII a week from Sunday, but again the NFL likely will do nothing about the matter. Can you imagine if a local New Orleans judge agreed with the lawsuit and ordered the Rams and Saints to replay the final two minutes of the game? And then the NFL had to rush an appeal to avoid this happening? This could be incredible legal theater to watch play out. Be the first to comment on "Louisiana Governor John Bel Edwards Sends Letter to Roger Goodell Over Call in Saints NFC Title Game Loss"